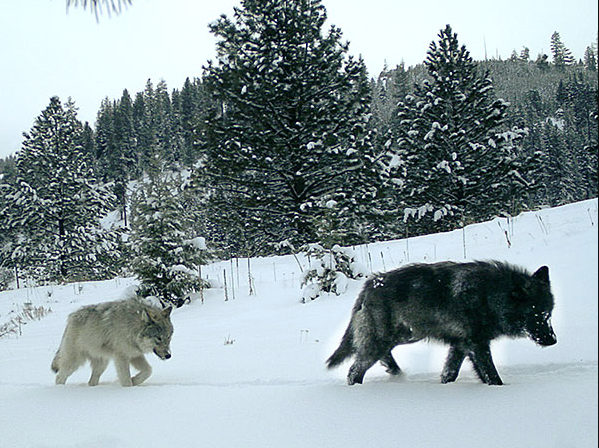 Call Governor Kate Brown’s office to oppose ODFW killing wolves in the Pine Creek wolf Pack! The Oregon Department of Fish and Wildlife recently authorized a cattle rancher in a remote part of Northeast Oregon to kill two wolves. The wolves are from a new wolf pack called the Pine Creek pack; they are accused of killing three calves and injuring four more on April 6th and 7th. The Pine Creek pack includes OR 36, an alpha female believed to be pregnant; OR 50, the breeding male; OR29, another adult wolf; and three yearling wolves. Wolves returned to Oregon about 20 years ago after being wiped out by bounty hunters in Oregon 70 years ago. There are believed to be only 124 wolves in Oregon today, so the wolf population is far from being recovered. set a limit of killing two wolves, with no stipulation set as to which wolves would be killed. to haze the wolves away from the private land where the depredations occurred—which is where they shot her. The rancher has until May 4 th to shoot another wolf—unless ODFW shoots it first. Under the Oregon wolf management plan guidelines, livestock ranchers are directed to take non-lethal measures to deter wolf attacks. However, if these don’t work, wolves can be killed following two depredations considered by ODFW to be from wolves killing livestock. An Oregon Public Broadcasting investigation found that this particular livestock owner, DelCurto, was implicated in controversial payments disbursed through Oregon’s rancher compensation program without evidence of wolf depredations. Ranchers are required to document livestock killings by wolves to get approval to kill the wolves. They must also avoid having any bones or carcasses in the livestock range that would attract wolves. In this case, ODFW says that data taken from the wolves’ radio collars show that the Pine Creek pack “have a pattern of routinely using this property at this time of year,” that seven wolves of the Pine Creek pack had been observed in the pasture where the calves were killed, and that the locations and size of the bite wounds were indicative of wolf attack. It is important to note that the non-lethal methods used to deter the wolves had prevented additional losses to depredation, so the state is allowing the wolf killing apparently as retribution. Please call on Governor Kate Brown and the Oregon Department of Fish and Wildlife to stop allowingthe killing of wolves, instead compensating ranchers for legitimate depredations, and to commit to revising the Oregon wolf management plan to prohibit the killing of wolves in Oregon. Thank you for speaking on behalf of Oregon’s wolves!